Belt sanders are the most aggressive style of portable sander and have the highest rate of material removal. They feature robust constructions, are very reliable and can cover large surface areas in very short spaces of time, They are however quite heavy and cumbersome which really restricts their use to applications on a horizontal plane. Their name is derived from the the continuous spinning sanding belt they use to level surfaces and remove large areas of material. The materials they are designed to sand comprise wood, plastic, metal, filler, old paint finishes and varnished surfaces. The rate of material removal and the surface quality a belt sander produces are mainly determined by the grade and type of sanding belt as well as the preselected belt speed. The higher the belt speed, the more material is removed and the finer the sanded surface. There are also long skinny belt sanders commonly known as file sanders. These variants feature a belt usually between 9mm and 13mm wide and are designed to sand the same materials as a belt sander but are ideal for narrow and awkward applications. Belt sanders feature many different components, and having a sound understanding of these plays an important part in the purchasing process and finding the best belt sander for you. Knowledge of these parts also aids in the efficient and effective use of the tool. The power source is the component that provides the tool with electricity. On belt sanders, this is done through a wired connection to a mains power supply. In Australia, belt sanders operate off mains power (240V) through a 10A socket. The longer the tool’s electrical power lead the better. The switch allows the electricity from the power source to flow through the tool. A belt sander is activated by a trigger switch. When the trigger is depressed, the tool will begin to operate. The lock-on button is located next to the trigger on the belt sander’s handle and can be pushed while the trigger is depressed to lock the tool on. To cease this function, simply pull the trigger. Motors are the main component of all power tools, and are the component that converts the electricity into motion. The power that motors produce is measured in Watts. Motors used in belt sanders are called AC motors (they are also known as universal or series motors). They will have an input power of between 600W and 1400W, and weigh between 2kg and 7kg. Many manufacturers will state only the input power of the sander, as this is the larger and more impressive number. This value is actually just an indication of the demand a tool will place on a power outlet under normal operating conditions. The power output at the sandpaper, though, is significantly less than the input power. This is due to the efficiency of the sander’s internal components, and how power is transferred through the machine. Generally speaking, higher quality tools have greater efficiency and require less input power to produce the same power output. Therefore, although it is uncommon for most manufacturers to include a power output value, it is a much better way of comparing tools. Also known as a gearbox, a transmission dictates the speed that a belt sander is capable of operating at. These speeds are usually between a minimum of 170m/min and a maximum of 380m/min, but vary depending on the model. 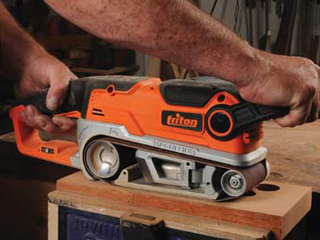 The belt sander can be set at any point between these two speeds by the speed control dial. The speed control dial is a small numbered thumbwheel on the belt sander that allows users to preset a speed selection, and gain more control over the tool. This setting should be the main variable adjusted on belt sanders as the user application changes. The housing of a power tool is the casing that protects the internal components. Belt sander housings are comprised of two main materials – plastic and metal. As the quality of a belt sander increase it will typically have more metal interwoven with plastic, making for a more robust and durable design. There is also a protective cover that can be taken off the side of any belt sander that reveals the drive belt if for some reason it needs replacing. A number of belt sander housings are designed so you can also lay the belt sander on its back, effectively turning it into a stationary bench sander. Further details on this are included under the heading Sanding Stand & Fence below. The handle is the where your dominant hand must be positioned to guide the tool and operate the sander’s trigger switch. The auxiliary handle is where your secondary hand must be placed, and can be positioned at a number of different angles for optimum comfort and control. There are two belt rollers on a belt sander that enable the belt to spin at the user-determined speed. On traditional designs both rollers were of the same diameter, but in more recent models across some brands the diameter of the front roller (also known as the tracking roller) has been reduced. This is simply to allow closer horizontal sanding to a vertical face and, contrary to some people’s beliefs, doesn’t weaken the belt. The tracking roller is also very slightly crowned (tapered off at the edges) to keep the belt running/tracking in the middle of the sanding plate. The clamping lever is located between the two belt rollers and moves the front roller back and forth to increase and decrease tension on the sanding belt. Simply pull out for tension release, allowing belts to be removed and refitted, and firmly push the spring loaded lever back in to bring the belt tension to the required level. The sanding plate is the smooth polished steel base plate of a belt sander that is essentially the sander’s ‘footprint.’ The larger this footprint the greater the sanding area. The sanding plate is covered by thin platen pad made of either cork or graphite fixed at the front end that enables the production of an optimum sanding pattern. These pads are subject to wear as the sandpaper runs over them, but the frequency of replacements heavily depends on circumstances of use. This is the plate on a belt sander that indicates where the sanding belt should positioned as it spins. As a rule of thumb, the edge of the sanding belt should run flush with this guide plate. The belt tracking knob is used to adjust the alignment of the sanding belt by moving the front roller left and right. This adjustment is usually made while the sander is running to make sure the belt isn’t making contact with the housing. If a belt continually runs against the side of the machine it can damage both the belt and the sander itself. Needless to say, this should be checked regularly and readjusted as necessary. Due to the high speed of belt rotation, it is very important to take all necessary precautions when adjusting this knob. Some new belt sanders now have electronic tracking, meaning you never have to adjust the belt alignment – a very useful feature. All belt sanders feature a dust extraction port for connection to either a dust bag/dust canister or vacuum cleaner/dust extraction unit. For small sanding jobs the dust bag or dust canister is more than adequate. This bag needs to be emptied regularly however to maintain optimum dust collection. For larger jobs a vacuum cleaner or dust extraction unit can be connected. This is done with the use of special proprietary connectors that can be ordered from the manufacturer for your specific model of sander. It is important to note that a specialised vacuum cleaner is required when sanding dry dust that is potentially detrimental to your health or carcinogenic. In addition, it is also a good idea to frequently check if the dust passage is clean so that the suction capacity remains at an optimum level. The sanding frame is a very useful accessory that locks into the housing of a belt sander. It is essentially a rectangular metal guide that allows for uniform and controllable removal capacity when sanding large wooden surfaces. It’s commonly sold separately, but is included with some models. Regardless, it is a worthwhile purchase if you intend sanding large surface areas. This is an optional accessory only available for some models of belt sander. The basic principle of this attachment is that it secures the belt sander to a bench on its back (again, only models designed to do so) by a set of clamps. It is also usually accompanied by an adjustable fence attachment that allows you control over the angle you sand your work at. This accessory is designed differently for each model of belt sander, but effectively turns your belt sander into two different tools, multiplying its potential use and increasing its value and versatility. Pleas note that using an attachment such as this is the only safe way to operate a belt sander as a stationary bench sander. When purchasing belts for your belt sander, first and foremost you must ensure they are the correct size for your machine. Once you’ve matched this up it is simply a matter of choosing what grade you need for the chosen application. For belt sanders, coarse sanding requires a P40 or P60, medium sanding requires either a P80, P100 or P120, and fine sanding requires a P180 or P240. Please be aware though that although these sanders will smooth off a surface, they aren’t finishing sanders and still won’t give you the finish of one – that is where an orbital sander or a random orbital sander will come into their own. For further information on the different types of sandpaper simply click here. When purchasing the best belt sander for you, decide what features are most important to you (from the specifications above) and make sure these are included in your final purchase. The main considerations you should make include how much power you require, the size, availability and consequent cost of replacement belts, and also how often you will be using it. As sanding belt sizes progress from smaller to larger belt sanding units become bigger, heavier and more powerful. Entry-level units commonly take the smaller 75mm x 457mm belts which are a great size for people just starting off. The mainstream size for most units in the DIY and trade ranges however is 75mm x 533mm. This size offers a good balance between portability and power, and won’t encourage the premature wearing of belts as smaller sizes do. Belts are also quite affordable and readily available. The larger 610mm long belts (in both 75mm and 100mm widths) fit the large heavy-duty trade units designed for the most demanding of work – and also for the experienced user. In short, you should look for a robust and durable belt sander that has plenty of high quality components. A solid dust extraction system is also a necessity, and the inclusion of a sanding frame is bound to be a very useful accessory if included. If you are chasing value for money, aim for a belt sander that can be converted into a stationary bench sander with a sanding stand and fence. Belt sanders can cost anywhere from $40 to $1500. File sanders can cost between $50 and $600. Specialised pipe sanders can hit the $1500 mark. To browse manufacturers of belt sanders, please select a company from our list of power tool manufacturers. The following tips will help to preserve the life of your belt sander and its sanding belts, increase your efficiency, and most importantly, keep you safe. They will also help to give you the best finish possible. Work with moderate feed and carry out the sanding with parallel and overlapping strokes. You can rejuvenate clogged sanding belts for a short time by pulling the edge of a piece of Perspex or rubber across the surface of the belt while it is running. The heat generated makes the sanding dust stick together and pulls it away from the sand paper grains.